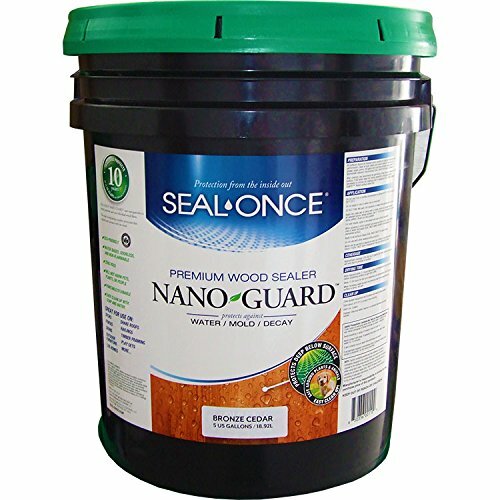 Seal-Once Nano Guard premium wood sealer deeply penetrates the surface to protect and stabilize wood against weather and caustic conditions. This formula uses proprietary nano-polymers to create a long-lasting flexible breathable barrier by coating the wood fibers at the cellular level to provide protection from the inside out. This product is premixed with Bronze Cedar semi-transparent tint which helps operate as a UV blocker to prevent the wood from graying while enhancing the natural grain and texture of your wood. If you have any questions about this product by Seal Once, contact us by completing and submitting the form below. If you are looking for a specif part number, please include it with your message.